Many parents arrive at school in the morning using different routes to get their kids to school on time. However, when these parents leave after dropping their kids off, it creates a large amount of traffic on Gloria Drive, leading to potential accidents and unsafe decisions made. This wasn’t the first time an issue had revolved around parking. Just over a year ago when our school had informed parents of the bomb threat, many had blocked streets in a crazed panic to rescue their sons and daughters away from potential harm. During that event, they had a valid reason and the school, while technically no longer in session, was unable to regulate the chaos. In addition to the potential morning mayhem that is occurring on Gloria Drive, the staff parking lot near the B-Wing continues to be the scene of parking violations of a different sort. In the morning, many parents tend to drop their kids off at the staff parking lot on the west side of the campus (near the B-Wing) simply because it’s the most convenient and efficient. It’s become a massive traffic jam in this unauthorized parking area for several reasons including rain, normal morning traffic and most noticeably in the last few minutes before the bell rings. According to Principal Van Natten, this behavior blocks a red lane that could deny emergency vehicles from entering the campus, and also interrupt school-bus arrivals and departures. Staff members using the parking lot have also been complaining about the amount of traffic generated in this location when they arrive or go to their vehicles to pick up supplies. The school had issued a police patrol car in hopes of enforcing the school’s ruling but parents continued to drop students off in the morning disregarding the warning from both the police and the school. Another attempt at enforcing the principal’s request has been the closing of the school gate that would normally lead to the B wing to discourage parents from dropping their students off there. 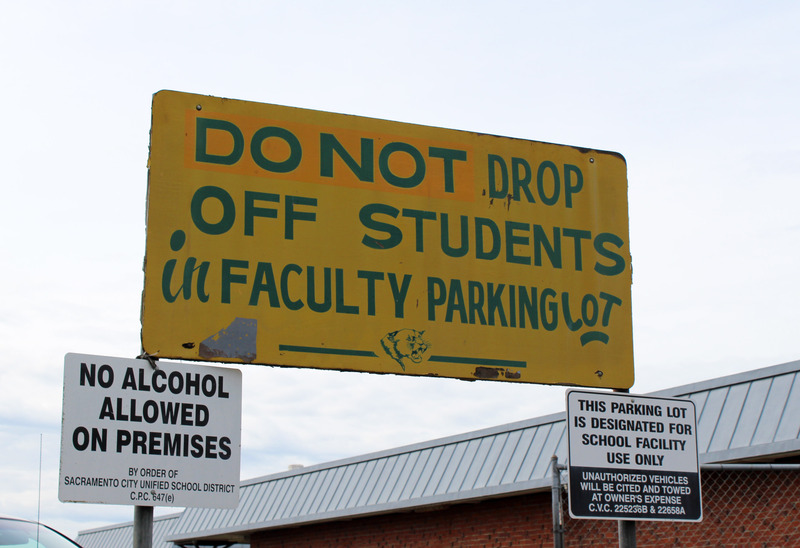 Even then, most students just go to a second entrance located near the auto shop which apparently did not add enough time to dissuade students from continuing to enter via the Staff Parking area. It seems as if parents are trying to avoid the congestion in front of the school by sneaking into the unauthorized staff parking area, hoping to save time (often running late themselves), or save their child from entering the campus from the main entrance or larger parking lot to the east. Parents using the staff parking lot does seem to violate some form of regulation that the school has had difficulty enforcing for many years. Despite the latest attempts to curtail that behavior by law enforcement presence or locking entrances, this issue will continue to plague Kennedy as it has in the past.